To have an effective mix of content for your buying cycle, it is important to understand the mix of objectives required in securing a sale. Potential buyers of technology solutions need to be able to visualize a technology solution running successfully in their specific environment before they will consider a purchase. There are a number of approaches to assist with this visualization process. No two prospects are exactly the same. For that reason, we recommend providing content to customers in a variety of mediums. Don’t restrict yourself to just video or only static stories. Try to provide a mix of media, and where using video, provide an easy to read transcript of the content on the same page. 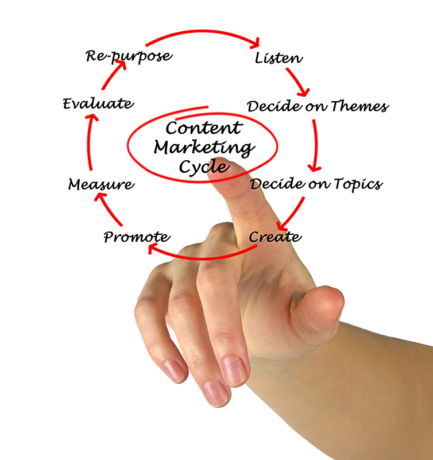 This method helps make your content easier to view and engage with for more potential buyers. Before you invest too heavily in any one area of content design, try to ensure you have a good mix of options across these areas for each available solution, vertical, or consulting approach. Showcase the Fit – For platforms and solutions that can cover a lot of ground, specific content to show the fit, by role, by industry, by technical function, etc is necessary to give a mix of buyer roles a clear understanding of how a solution will fit in your environment. Use cases are a great starting point for this, and are easy to create even at the point of product launch. Well defined use cases are helpful both on the website and in sales presentations. Specific use case pages on your website are great linking targets for blog posts about pain. Quantify the Need – While every organization and role faces pain of some sort, to drive consideration and adoption of technology, content that helps quantify and normalize the business need is helpful. When pains are severe enough (with high visibility in a prospect organization), this content is less necessary, but for anything that might be “on the fence” and contained within a single department or team, normalization is helpful to drive solution consideration. Whitepapers and articles highlighting specific challenges in real terms are helpful to address this. Highlight Success – Case studies and testimonials provide the quickest route to highlight prior success. Can be utilized to prove business value statements, create comparisons with competing approaches, and highlight some of the “soft” benefits of engaging with your firm. These stories can take a number of forms, from web/blog articles, to high-gloss powerpoint and brief-style documents, to video driven stories. Product Comparison Content – With so many buyers reviewing information and options online before talking to salespeople, developing ways to contrast your solution with other direct and indirect competition in-market can often be a helpful exercise. Feature grids, blog posts that explain key differences in the approach are helpful reinforcement. If you’re wary of presenting your solution in this context, potentially giving prospects ideas of other vendors to pursue, instead focusing on stories that involve migrating customers off of competitive platforms are also helpful and accomplish a similar objective. How To Guides – Content that can be helpful for onboarding new customers can also be leveraged in your sales cycle to showcase how your solution can successfully accomplish objectives. This type of content tends to be most useful late in the sales process, as the prospect is doing due diligence to ensure a solution will be a strong fit for their objectives and environment. Sales team members should be particularly mindful of this onboarding content if presented with late stage objections or questions about how things will work after the sale. Infographics – Infographics are a form of visual storytelling and can fit in a number of the categories above. The most compelling infographics will take the form of statistical storytelling and can work quite well alongside a longer form whitepaper (a visual reinforcement of longer form content). Explainer Videos – Explainer videos are typically used to help showcase fit. In this case, we’re avoiding restricting the concept to animation vs application use. At the highest level, it will explain the totality of your solution, why it was created and who/how it can help. Split into functional use cases, they can provide clarity and focus into specific uses as appropriate. Some short form product demos will fall into this category. Testimonial Videos – Are great ways to showcase who you’re working with and to hear reinforcing explanations in the voice of your customers. Testimonial videos can convey and relay positive emotion from your work more effectively than just about any other means. ROI/TCO Calculators – Many forms exist to highlight ROI and TCO. There is generally a low level of consumer trust in overly simplified calculators on vendor websites. Best approach to counter this is to be sure you’re giving buyers an easy way to see the math being used or to incorporate a more detailed calculation process into your Sales process or initial assessment offering. Use the calculator on your website as a starting point to a deeper discussion that fits a prospect’s specific situation. Blogging – Blogging is the best possible place to make supporting arguments for your solution. Focusing on challenges buyers commonly face and providing insights into how they are overcome should be your first objective. Secondly, the blog is the place to expand your SEO footprint to encompass alternative terms for your solution, or helper terms that don’t fit on the main solution page. The blog should be incorporated as a central component in your social media strategy. Adding articles that are of general interest to your market is a way to provide helpful and insightful content. Having a mix of content here is helpful to drive future engagement, if we’re selling all the time, readers will only visit when they’re ready to buy. Many of these elements are covered in our Product Launch Marketing Webinar, which focused on the core pieces needed to initially launch a new solution. If you’re following strong SEO principles, your content will reinforce your search position as well as provide a strong base from which to launch social media and email campaign efforts. Ensuring that marketing is providing content in formats that are useful to the sales team, particularly in the form of powerpoint slides helps avoid situations where sales content drifts away from the central themes used during the initial marketing outreach and discovery. Proper alignment of content helps drive greater success for both sales and marketing.